I’m so excited today, because instead of me writing for you, you get the fabulously talented Shelly from Vegetarian ‘Ventures is here instead! She’s going to do a much needed Tuesday Tutorial on veggie broth, and next week you can see what I made with it! So here we go. Heyyya! My name is Shelly and I usually blog over at Vegetarian ‘Ventures. 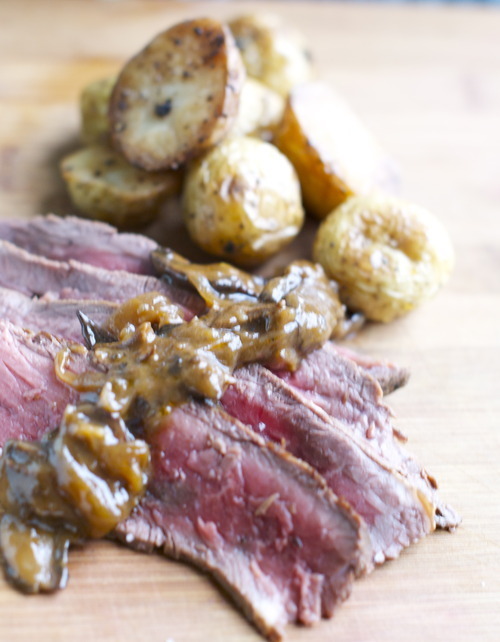 I’m filling in for Claire today and am going to teach you my favorite kitchen tutorial. 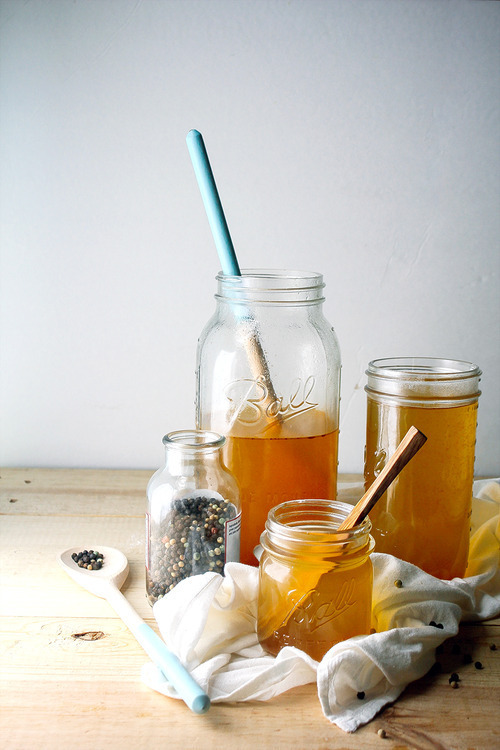 Today I’d like to talk about my favorite winter kitchen secret: homemade vegetable broth! Excuse me while I nerd out a little but this really is one of my favorite kitchen topics. I know, I know - broth?! 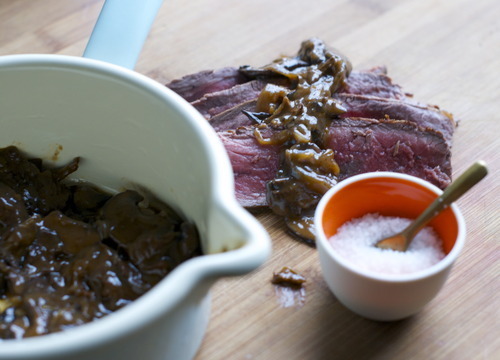 But really - it’s one of the easiest and most practical ingredients in the kitchen. How many times have you bought a can of broth only to throw half of it away? Or let those cartons sit in your fridge until they start to expand so much they are going to explode? Well, I’m here to tell you that it doesn’t have to be like that. 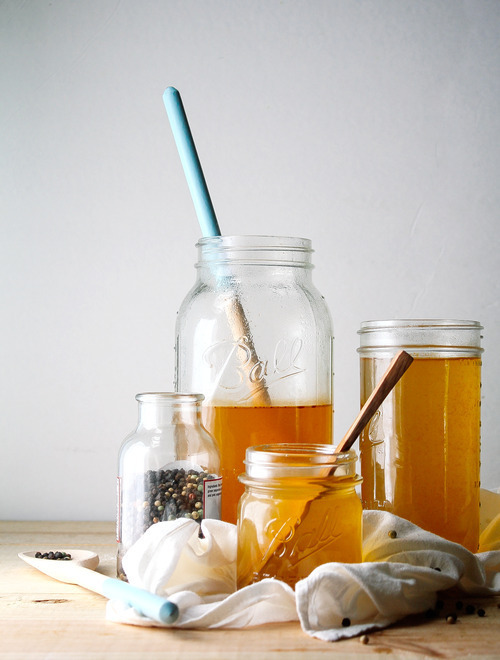 You can make your own broth by the gallons and freeze it to hold you over all winter. Homemade veggie broth lasts for two months in the freezer! No more letting those cartons explode after a week and a half! Not sold yet on why this is the best winter kitchen trick? Here is another reason why it’s great: you don’t have to spend any extra money on ingredients (except if you factor in a small part of your water bill). I just freeze leftover veggie scraps (ends of carrots, celery after it’s gone limp, kale stems, slightly wilted cilantro, etc) until I’ve filled up a freezer bag full. 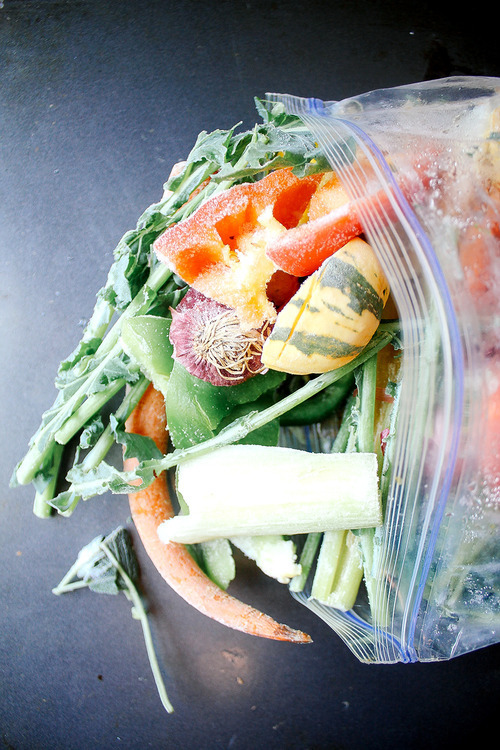 Once the bag is crammed with vegetables, herbs, stems, and spices, I know it’s time to whip up some broth. Okay, so let’s make some broth! There is no exact science to this and no real wrong / right way. I love the way no two batches of broth turn out the same. In the summer, my vegetable scraps reflect a light broth with red hues from tomato chunks. 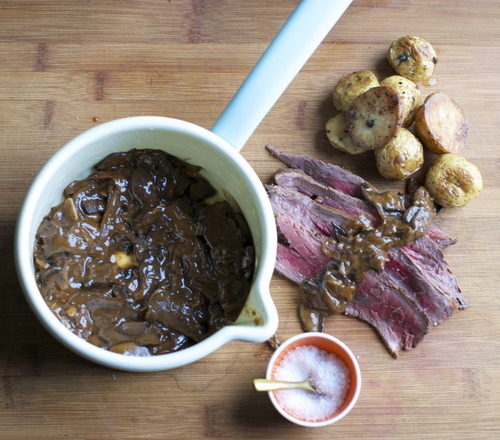 In the winter, my broths tend to be dark brown with loads of root vegetables and leftover rosemary. As I keep stating, use what you have on hand and experiment. It’s going to turn out delicious no matter what. 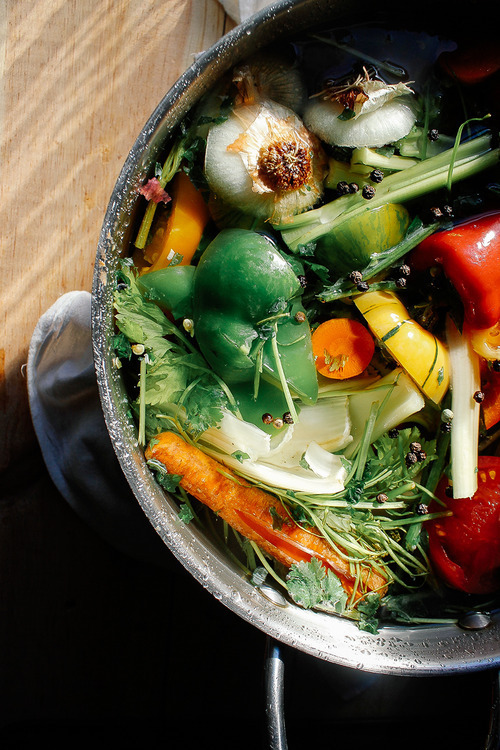 Place all vegetables in a large stockpot and cover with water. Heat over high until boiling. Lower heat to a simmer and let simmer for one hour. Remove from heat and strain the broth into a large saucepan to let cool. Add a splash of soy sauce if you’d like (completely optional). Okay, cool - I made vegetable broth! Now what? Well, let’s talk about freezing. You could freeze it in a block but it sure is a hassle when trying to break off only a cup full. I recommend you freeze it in ice cube trays and then transfer them to zip log bags once frozen. The amount will completely depend on how full you make the trays, but 6 ice cubes = a half cup for me. If you want to figure out an equation for you, fill a measuring cup with 1/2 cup of vegetable broth and pour it into ice trays. Easy. Done. Now you can pull exactly the right amount out next time you are looking to make that certain soup recipe. You may think ‘well, I don’t use that much broth… there is no way I’ll use up a gallon of it in 2 months.” Oh, you’d be surprised! Especially once you have it on hand and taste how delicious it is. 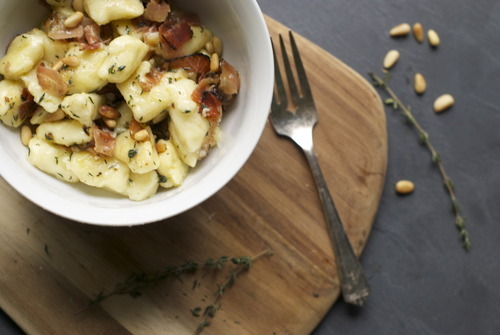 Not only can you incorporate it into warming soups and stews but you can also use it in risotto, pot pies, and even slurp it by itself for an afternoon boost. And now is a great time to make some broth to have on hand for the holidays coming up! Thanks so much for reading my rant about vegetable broth! I hope I’ve inspired you to try it out for yourself. Feel free to come visit me over at Vegetarian ‘Ventures if you’d like to be friends! The rains have started. We’ll probably have a couple more sunny days, but mostly it’s Fall here. Our mountains won’t turn red and orange, they’ll stay a blackish green, but the tops will fall under a fog. Even though it’s still warm now, it will be sweater weather soon. As much as I love summer, and I still have a small vacation to take, I’m looking forward to the cold. The cozy feeling of watching the rain fall with a cup of tea in your hands. The gentle scratcing of wool scarves at your neck. New boots. The time of year to take things a little bit slower, and to make pastries by hand. This is my absolute favourite kind of dough to make, I remember my mom teaching me as a little girl. Gently breaking up the butter with my hands and kneading the dough were two of my favourite things as a kid. I have since made it hundreds, if not thousands of times in my life. It is the kind of pastry that normally takes a few tries to get right, but this little trick- curtesy of the Tartine Bakery Cookbook- in which you roll the butter, makes all the difference. 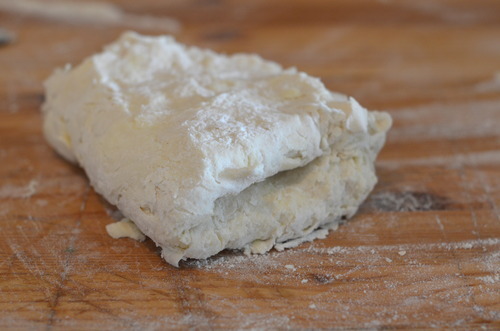 I like to call this dough a rough puff pastry, it’s not quite as light as a puff, but it’s not far off, and while the method is closer to a pie dough, it’s much flakier and crisper than that. I rarely have the energy or patience for puff pastry, and almost any recipe that calls for it gets this instead. I use it for pies, tarts, cookies, savoury tarts, mini cinnamon buns. Nearly anything that calls for pastry, you could use this. It’s the ultimate pastry in my books. On a clean flat surface sprinkle the flour and salt. 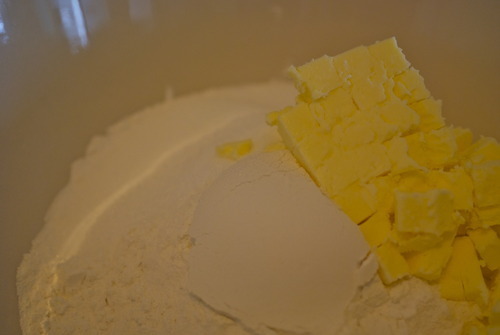 Break the butter apart into the cubes and toss to coat them in the flour. 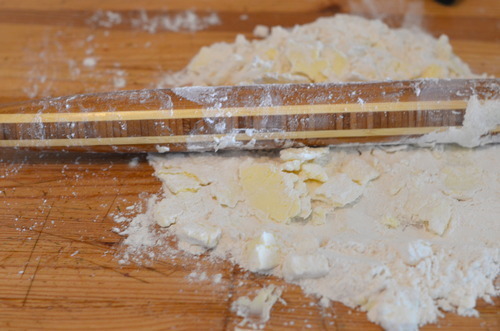 With your rolling pin begin to roll the butter out. It will stick to your rolling pin and the counter but don’t worry. 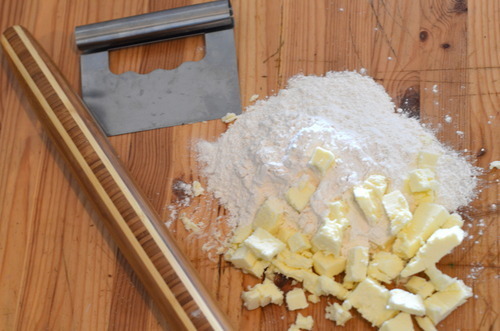 Use a pastry scraper, or a spatula and scrape the pastry off. Then keep rolling. Push the butter bits from the outsides in to make sure all of the butter has been rolled into thin strips. Pour about 1/4 cup of water on top of the flour mixture and, again using the pastry scraper or spatula, fold the dough on top of it’s self. 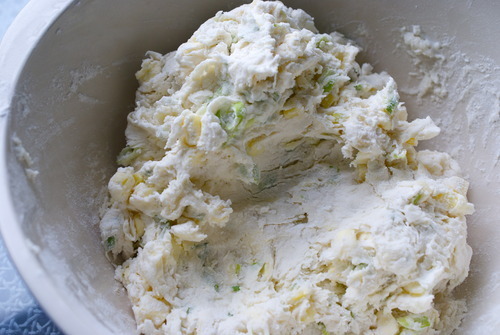 Add more water, a couple table spoons at a time, and keep folding the dough over, pushing it down, and folding it again until some flour remains on the surface but it’s holding together. It shouldn’t be sticky to the touch but it shouldn’t be falling apart either. Keep folding the dough, pushing it out, and folding it again. 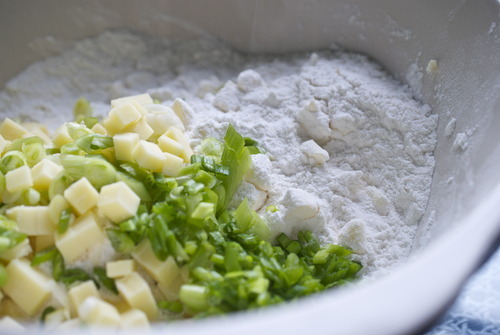 This is putting the layers into your pastry that will make it so light and crisp. 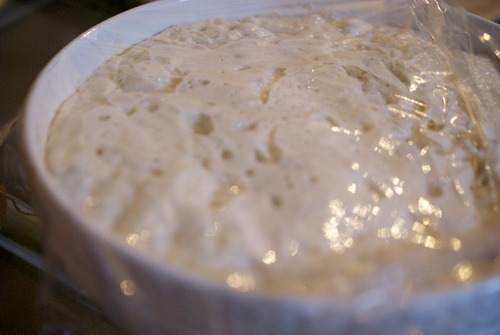 The dough should be soft to work with, as soon as you start to notice it resisting your touch stop. Wrap with plastic wrap and refridgerate for at least an hour. I usually make two batches and keep one in the freezer, so I always have some on hand. It will last 2 days in the fridge, or a month in the freezer. 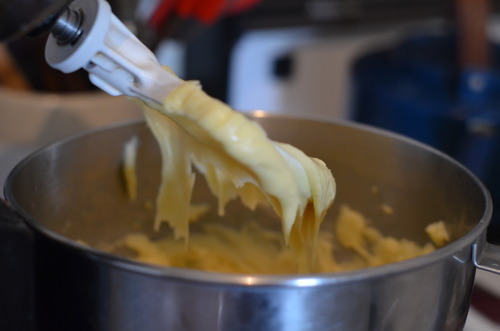 Choux paste is magical stuff. It’s a simple mix of eggs, flour, butter and milk, but the result is glorious. 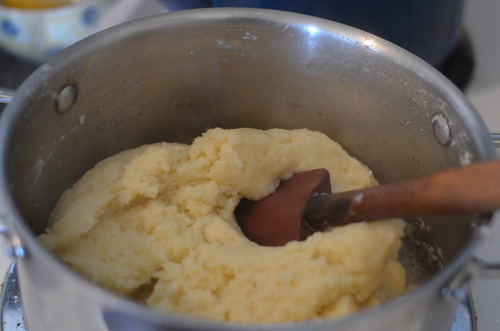 Mix some cheese into it and once it’s baked it becomes gougeres. 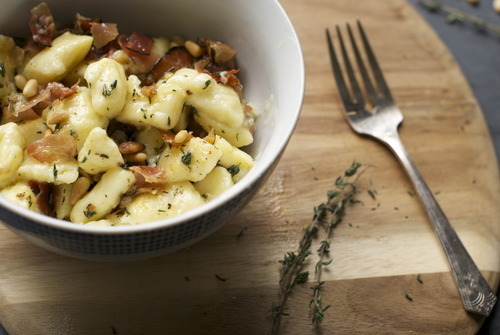 Boil small pieces of it and it’s Parisienne gnocchi. Add some apples to the mix and fry it and it’s a fritter. Pipe it into little balls and your nearly at a profiterole, or cream puff. Pipe it a bit longer and you’ve nearly made an eclair. Seriously, there is little that choux paste can’t do. It’s pretty amazing. You should learn how to make it. Stat. “Oh, really? Should we call you Eclair?” No dude, Claire will do just fine. But to avoid being bitter and I’ve decided I just need to get crazy good at making eclairs. Somehow this feels like retaliation, even if almost no one knows how good I am at them but me. This way I can chuckle to myself and think at how awesome my eclairs are when old men say this to me. It’s silly, I know it. But it makes me feel better. 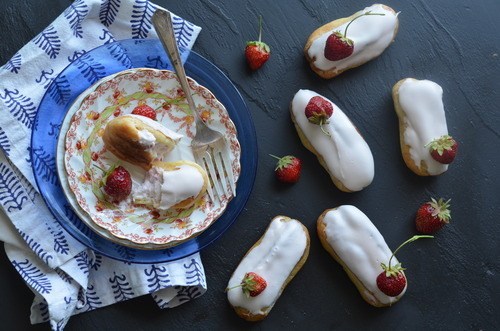 This eclairs are pretty fantastic, if I may. 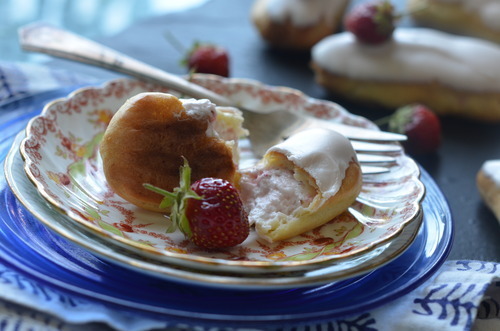 They are super fresh tasting, filled with a whip cream that’s spiked with crushed strawberries, and a bit of vanilla. Then they are carefully dipped into fondant that’s scented with rosewater. These are kind of ridiculously good. I ate an astonishing number of them. So many in fact, that I lied to my boyfriend about how many I made. And then I felt no guilt. About the eating or the lying. They were that good. 1 tsp Rosewater, or as needed. In a medium pot, melt the butter. Add in the water and bring to a boil. Mix in the salt and flour and stir for about 4 minutes, until it is very thick and the flour is cooked. 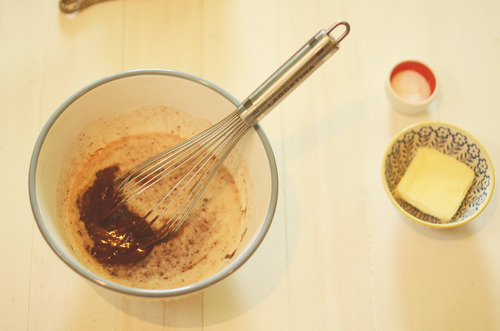 Put the flour mixture into the bowl of a standing mixer fitted with the paddle attachment. Start beating on medium speed. Add in one egg. 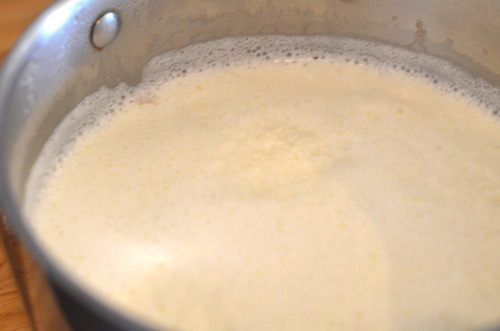 Wait until it is fully combined before adding the next, continueing this until all the eggs are combined and the mixture is soft, shiny and smooth. 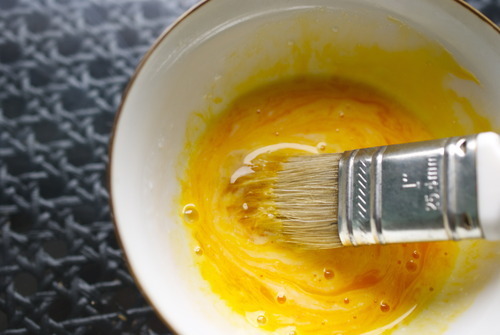 This is your choux paste! Fit a piping bag with a large star tip, and transfer the choux paste into it. 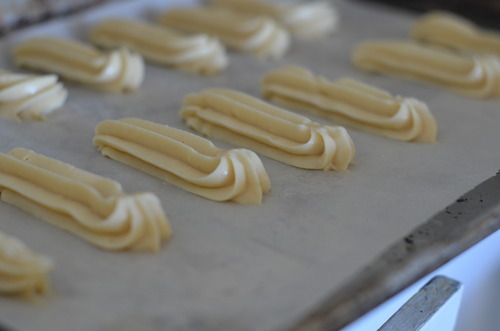 Pipe the shape of an eclair onto your prepared trays, being as careful as you can to make them the same sizes. Bake for about 25 minutes, rotating the tray half way through baking. Mash up strawberries as finely as you can- this can be done in the food processor or simply with a fork. Strain them through a fine seive. Whip the cream to stiff peaks, mix in the icing sugar. Fold the strawberry puree in. 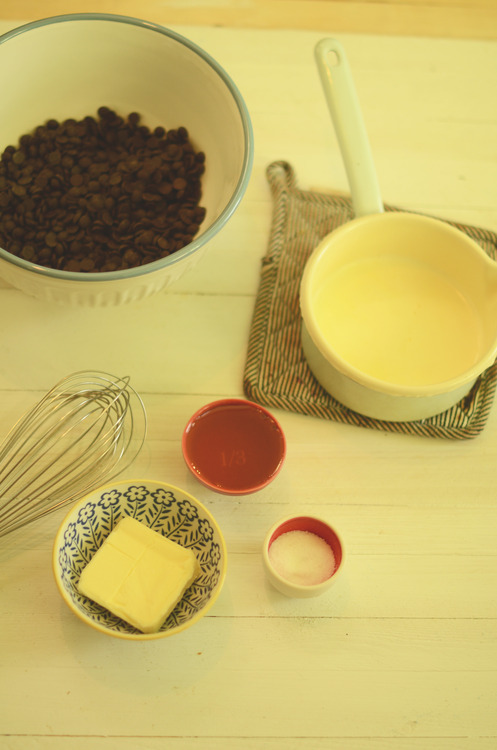 Transfer to a piping bag with a thin round tip and move to the fridge until ready to use. 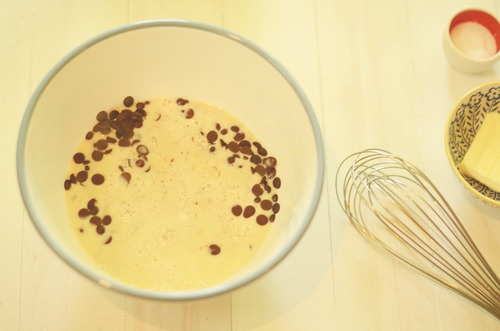 In a double boiler melt the fondant. Add in the rosewater and stir to combine. Check for taste. I live in what was traditionally Little Italy, an area called Commercial Drive. There are two big pizza places, a divorced couple who hate each other and own two competing, but equally horrible overpriced restaurants across the street from each other. There were a couple cheap slice joints, you those weird ones that put sesame seeds on the crust? Those kinds of cheap slice joints. Then a couple years ago there was a bit of an outcry that there was no good proper pizza in Vancouver. And then two years ago was the year pizza came to the city. In droves. There is pizza everywhere. Here’s the thing of it. I love pizza. Good proper Neopolitan pizza is hard to beat. And I eat it all the time. The best pizza joint in the city is now 3 blocks away from my house. And a totally reasonably good place is 1 block from my house. And it has this lunch special, and I am there all the time. All the time! And while pizza isn’t expensive, I have decided that this year is the year to not go out for cheapy lunches and to make dinner at home more. So I’m going to start making pizza at home. Partly to save money, yes, I’ll admit to that, but largely because I can make proper pizza at home. And it’s unbelievably easy. 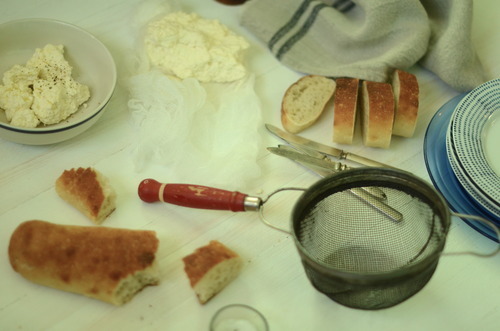 Heres the thing of it, you don’t knead the dough. And you don’t cook the sauce. 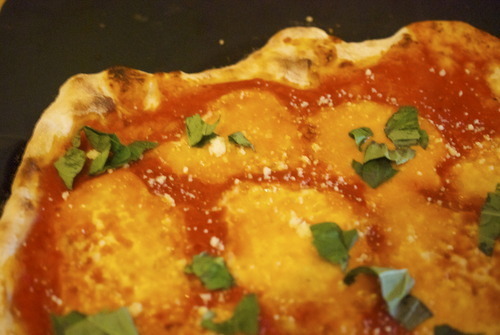 Are you ready to make wonderful pizza at home without kneading the dough or cooking the sauce? 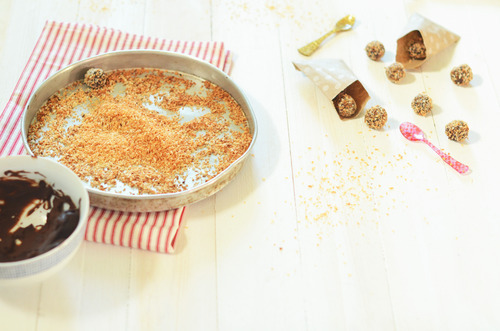 With a wooden spoon mix all the dough ingredients in a large bowl. When it’s all combined cover it with plastic wrap and leave it. Forget about it for 18 hours! 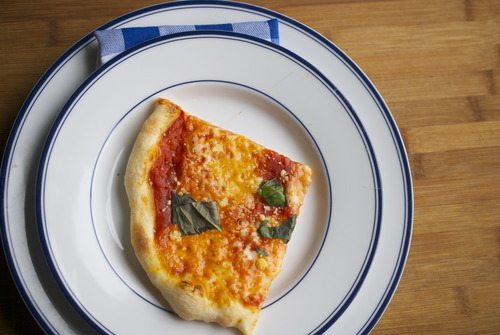 This is sort of a loose measure of time, I make mine before I go to bed and it works out beautiful when I make dinner, but I have also been impatient and used the dough and made pizza for lunch and it worked really well too. I’d say 13-20 hours is the range really. When your ready the dough will make 2 big pizzas. Preheat your oven as hot as it will go. Mine is 500F. If you have a pizza stone, use it. If not, just take an old baking sheet and put that in your oven and let it get toasty hot. Once the oven is hot enough let it sit at that temperature for at least 15 minutes before you start working on the dough. 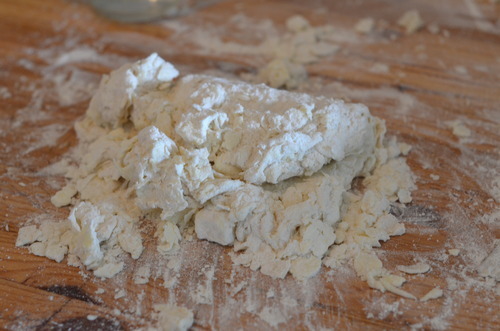 The dough will be very soft and sticky so use lots of flour. The first rule of dough is not to roll it. Carefully with your fingers streth the dough out, I find it easiest to hold the dough in the air put your clenched fists under it and gently pull them apart. 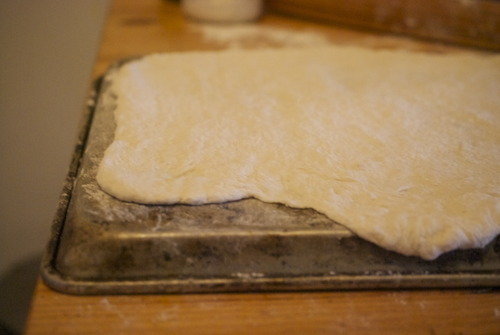 The dough will get thin, then put it on a well floured surface and use your fingertips to stretch out the edges. Generously flour a rimless baking sheet or the bottom of a rimmed baking sheet. Put the dough on top of that. 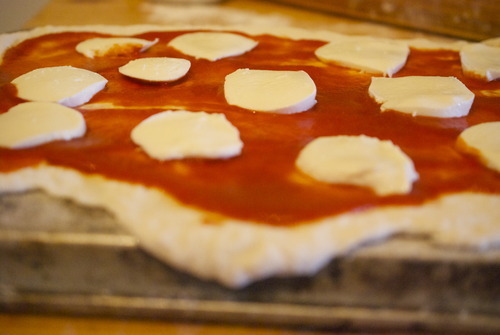 Use half the strained tomatoes and spread over the dough leaving a half inch of space around the edges for the crust. Cut the cheese thinly and put 2 balls worth on each pizza. 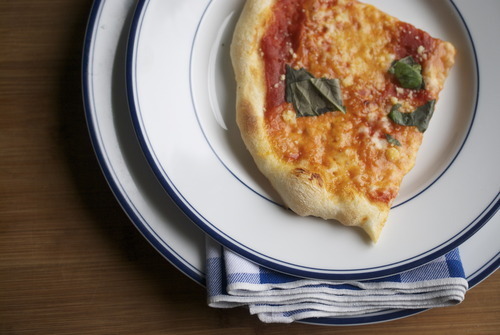 Take out your pizza stone or baking sheet. With quick jerking motions slide the pizza off your cold tray and onto the hot one. Immediately put it in the oven. I have what might possibly be the worst oven of all time. If your oven cooks as unevenly as mine you’ll have to rotate your halfway through cooking, although if you can keep the oven shut that’s the best thing. After 2 minutes of baking turn the broiler on for 2 minutes. This should help the dough get a bit charred. After 4 minutes your pizza should be done. Get it out of the oven, sprinkle with parm and torn basil and eat while it is still piping hot! The second instalment in my new weekly column, where I talk about food basics, and give you the step by step know-how to do it at home. The restaurant where I work recently started to do brunch, and before we opened I was chatting with the chef about what kinds of pastries he might want. The original idea was croissants which, despite obviously being delicious, are also so tedious to make, especially in a kitchen with as little counter space as ours, so I threw out the idea of making biscuits. This did not go over. Biscuits are dry, biscuits are bland, biscuitsare over done, and never delicious. So I, being the super competitive person that I am, decided to make him some. 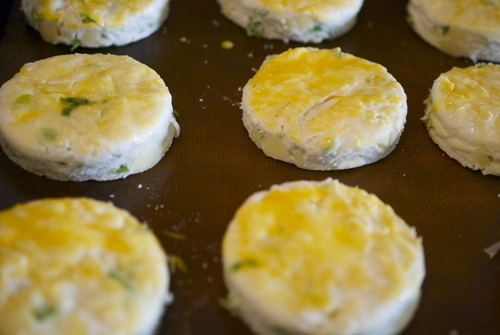 I made savoury biscuits, ones with chunks of cheddar and dots of scallions, and let the restaurant fill up with the smell of cooking butter and melting cheese. And then I dared him not to like them. He is not the first person I have converted to a biscuit lover, but if we’re being real here, most of this credit can go to my Grammy. 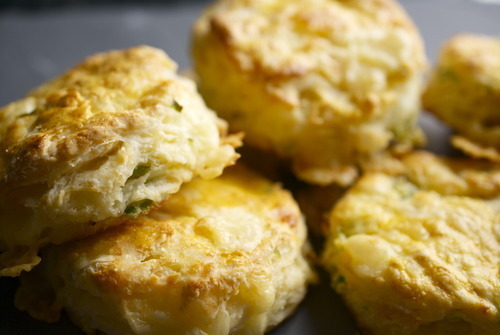 Grammy made “Cloud Biscuits”, light, airy, full of layers and always moist. 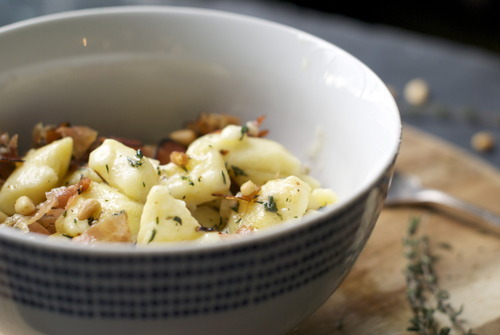 Growing up they were always made with fish chowder, or if we were lucky, for breakfast. Hers was a different recipe than this, because hers was a different time. 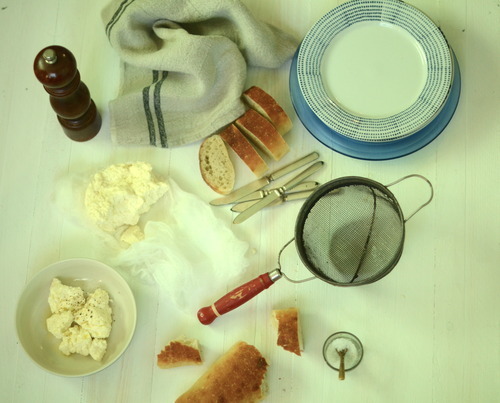 In the Great Depression butter was a serious luxury, so the cloud biscuits were always made with shortening, and just a tablespoon or so of the good stuff to give it flavour. But it was the texture that got me hooked. Which is funny, because most people complain about the texture, they think dry, over cooked, bland. So here is THE way to make the perfect biscuit. 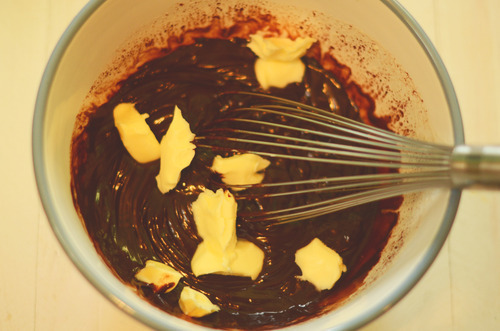 The way you get layers is by using big chunks of really cold butter. 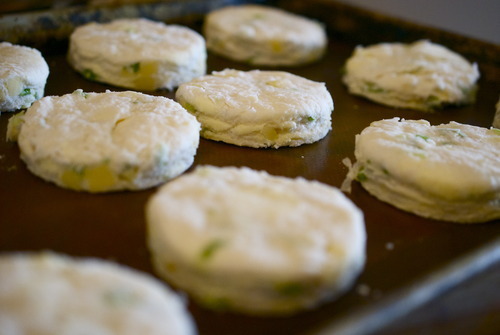 When that cold butter goes into the hot oven it produces steam, and if you have the right formations of butter you get perfect light fluffy biscuits. You need to knead, but not too much. 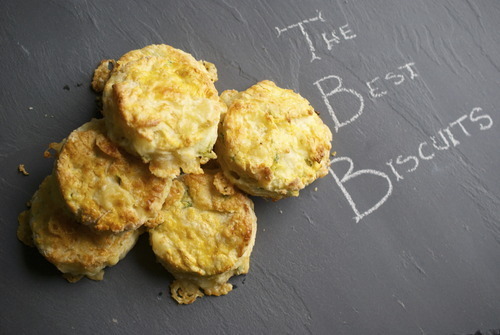 Flour has gluten in it, and gluten will make your biscuits tough. But you need to knead your dough in order to get in the layers. This means really feeling the dough, as you knead it when it starts to get tough, it’s time to stop. Use good ingredients. If your going to add cheese to your biscuit, make it good aged cheese. There are only a few things in your biscuits, make sure they’re adding something. Be creative! 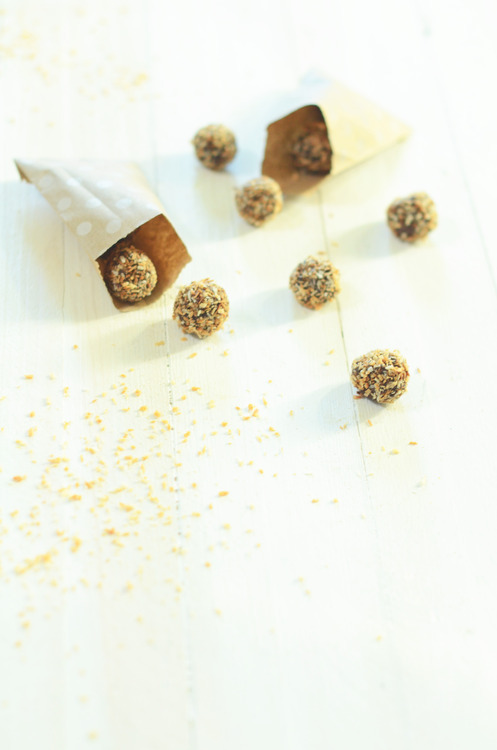 There are a million things you can do to a biscuit, don’t limit yourself and have fun with the possibilities! 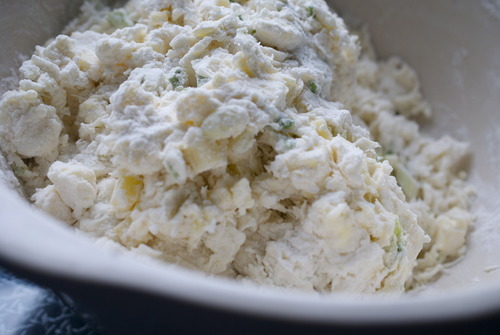 Add in the butter and with your hands, or a pastry scraper, break the butter up into lima bean sized pieces, or about the size of your pinky finger nail. Add in any flavourings, in these ones I used cheddar and scallions, but the world is your oyster on this one. 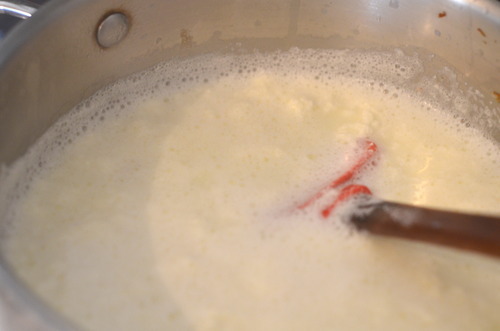 Carefully pour the buttermilk in and mix it with a spatula or spoon until it just begins to come together. Push the dough down with the palms of your hands and then fold the dough in half. Continue doing this 4-6 times or until you just start to feel resistance. 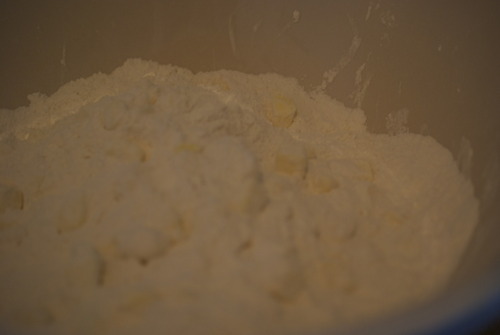 Put the dough onto a lightly floured surface and roll out to about 3/4 inch thick. Cut the dough out into whatever shapes you like, traditionally savoury are round and sweet ones are cut into triangles. 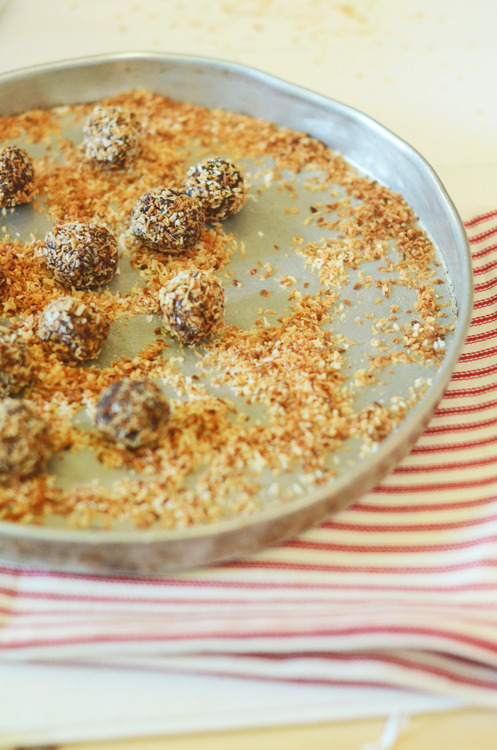 Put them on a baking sheet lined with a silpat or parchment paper and put them in the freezer for 15 minutes. 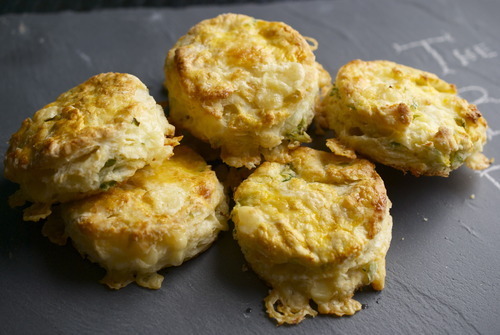 Take the biscuits out of the freezer and brush the tops with your egg wash.
Don’t open the door for the first 12 minutes, afterwards you can open it and turn the pan so that it cooks evenly. After about 20 minutes the tops should be nicely browned and you should be able to see a significant rise. Allow to cool before eating.